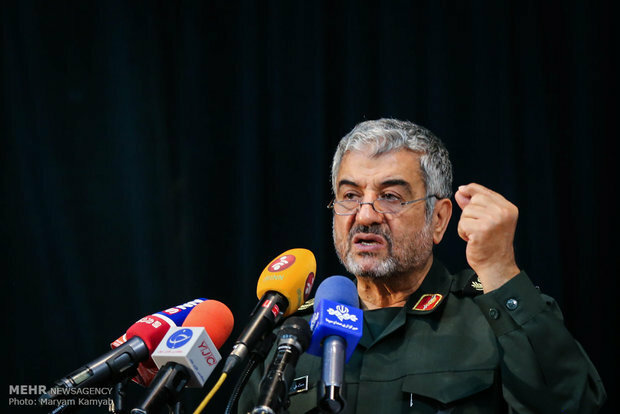 Chief-Commander of the Islamic Revolution Guards Corps Major General Mohammad Ali Jafari says US President Donald Trump has made a miscalculation about Iran’s power as the IRGC enjoys the military power to defend the Middle East in even less than 12 minutes. General Jafari on Friday underlined that Trump was wrong when he speculated that the Islamic Republic’s power has decreased since he took office, ifpnews reported. “If in the past we could defend the Middle East, not to impose our hegemony on the whole region, within 12 minutes [as mentioned by Trump], today the time is even lower than that,” he said in an interview with Yemeni TV channel Almasirah. The IRGC chief commander also said the nature of the Islamic Revolution and Iran shows that the more the country is involved in wars, the more its strength grows. He underlined that Iran will never avoid giving decisive responses outside its borders if its security is endangered. The top commander also underlined that the resistance front has become stronger after the war in Iraq and Syria, adding there is no concern at all today about the condition of the movement. “Look at Iran, before I got there (to the White House), Iran was going to take (control of) the Middle East in about 12 minutes, right?” Trump said in the city of Council Bluffs in the state of Iowa. He once again urged the Saudi Crown Prince Mohammed bin Salman to pay the US in return for its own security in the region and said if he hadn’t come to power the Arab World couldn’t stand against Iran’s “threat” for even 12 minutes. He also claimed that since the beginning of his administration, the Iranian authorities “are trying to survive”, while there are “riots” in each of their cities.